Here she is all painted up and looking very smart. All the crews hard work(THANK YOU), is paying off. Spindrift's looking good. Lots more to do befor she's ready for the water and time is pushing on. The Helford look fantastic from up here and I'm really looking forward to being back out on my mooring. More painting, some electrics and a bit of woodwork/engineering to do and we will be ready. With loads of help from my super crew Spindrift is getting a make over. Well a repaint and a bit of a sort out really. Here she is in her winter home all sanded and getting new make up. What would we do with out the super crew. THANK YOU crew . Still lots of work to be done and we are so looking forward to enjoying the Helford this year. 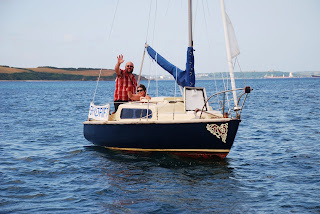 Last year was great... Loads of sailing... Now ...Its time to sort things out and get ready for another year. Last year due to a very hurty back Spindrift didn't come out of the water. She spent the winter sitting happily up the creek. That means that I haven't done anything to the old girl for 2 years now.So its time for some serious maintenance and a chance to sort out all those little things that "will get done one day". Today is one day, so off we go. Pictures to follow and stuff to be done. All the time looking out over the Helford , What could be better ? 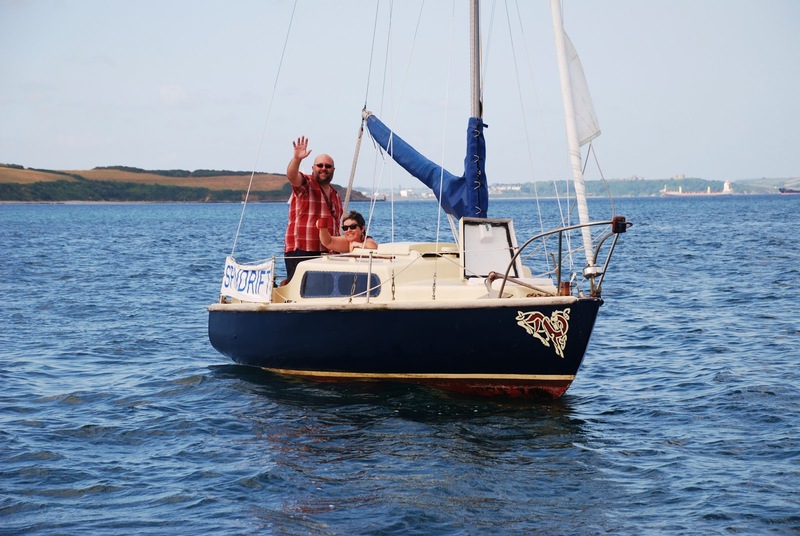 This year we have spent loads of time sailing around the Helford river, from our mooring by the Helford River Sailing Club. So far its been the best year, the club has been very welcoming every time we come home. After a few hours sailing around to have a pint or two and watch the river go by, is just bliss. Here we are meeting our good friend Justin who was also sailing home. Thanks for the Pic and see you soon. out of the river towards the sea. New cushions, made and waterproofed by us as having them made was very cost prohibitive. They look very smart, a bit bright but as Sarah did all the sewing I didn't get much choice in the decision. They have been waterproofed very well so should be fine. From space Cornwall is shaped like a Christmas stocking. It is often said that all the nuts end up at the bottom of the stocking. Now they have started riding bikes.